Yingkou Changsheng Steel Structure Project Co.Ltd is a professional manufacturer and supplier of roll forming machine in China. With 5 million registered capital, Changsheng Company produces various kinds of products, such as arch roof forming machines (ultimate building machine, automatic building machine), no-girder automatic building machines (automatic building machine), special metal forming equipment and auxiliary equipment and products. Additionally, we also supply OEM service. At Changsheng, good quality is the first element we care about, so that ISO9001-2000 Quality Management System Certification and CE Certification have been received by our endless effort. 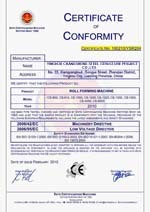 In the production process, we strictly adhere to quality control standards, which make our roll forming machine have the premium quality. Briefly, our products has been popular at home and abroad, and we have exported to many countries, such as Germany, Holland, India, Indonesia, New Zealand, Syria, United Arab Emirates, Russia, Kuwait, South Africa, and Bangladesh. At the same time, we offer convenient after service. First, the installation and debugging can be available, but we don’t offer sample. Second, we also provide quick-wear parts replacement service within 3 years; however, the goods must be delivered to us in 25 days. Third, we offer 1year warranty, and free installation and debugging.